This week I will write a daily diary. 3:15 a.m. The alarm rings and it’s time to begin another day. I pack my husband Joe’s lunch and fill his water jug with ice and water. I pack extra food so Joe can eat a little something at break time. It’s too early at this time of the morning for him to be hungry. They start work at 5:00 a.m. and their break is at 9:00 a.m.
3:45 a.m. Joe’s ride is here to take him to the RV factory. The driver picks up four other Amish men before Joe is picked up. The ride usually takes 40 to 45 minutes from our house. I go back to bed for an hour after Joe leaves. 4:45 a.m. Daughters Elizabeth, 20, and Susan, 19, pack their lunches. Sons Benjamin, 15, and Joseph, 12, go out to the barn to milk the cow and feed the animals. Joseph usually milks the cow while Benjamin feeds the animals. I make Benjamin two grilled cheese sandwiches and pack his lunch. Benjamin likes ham sandwiches for lunch. He doesn’t want anything else. The girls divide a grilled cheese sandwich. 5:15 a.m. Elizabeth’s ride is here to go to the RV factory. Benjamin comes in to eat his breakfast. 5:30 a.m. Susan and Benjamin’s ride is here. Susan started her new job at nephew Emanul’s on Monday. Benjamin’s driver drops her off at Emanul’s shop when he takes Benjamin to Mose’s place to help with the saw mill. 5:40 a.m. Joseph brings the milk in. I put it through the strainer and put it in the refrigerator to cool. Joseph goes back out to get the gas lantern. Joseph usually lays down for a half hour nap until it’s time to get the others up. Sometimes he stays up and reads. 7:00 a.m. The bus is here. Loretta, Joseph, Lovina, and Kevin leave for school. Verena hardly ever eats much for breakfast. I make an egg and toast for me. Verena packs her lunch. Verena and I wash all the dishes and clean up the house. 8:30 a.m. Verena leaves for work. 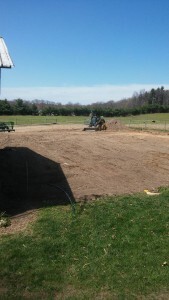 Our neighbor is here leveling out the ground. We hope to start on our new building next week. We are planning to put up a 50 x 80 foot pole barn. 11:00 a.m. A repair man comes to change the gas pilot assembly on my oven. He came out a week ago to see why it wouldn’t light and had to order a new part. I really missed being without an oven for a week. 1:00 p.m. Susan comes home from work. 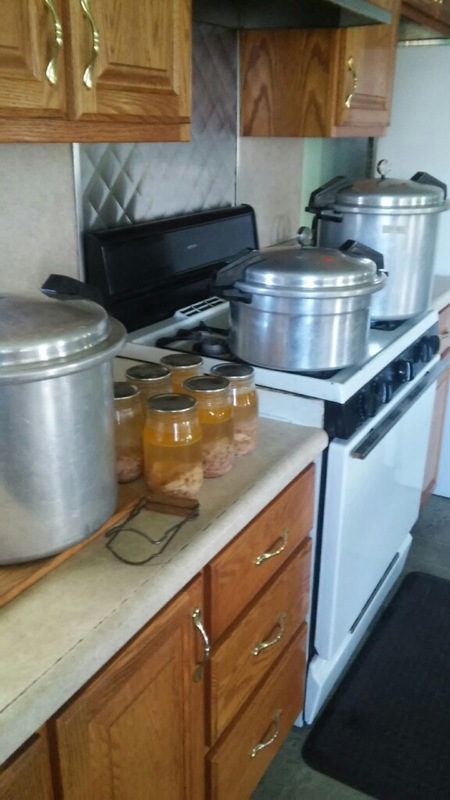 Lovina’s kitchen is full of equipment she uses in canning chicken broth. 1:30 p.m. Joe comes home from work. 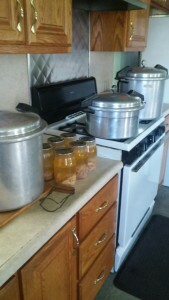 I’m still canning chicken. We butchered our 34 older chickens on Saturday. I cooked the meat off the bones on Monday and Tuesday and am getting it in jars now. 6:00 p.m. Supper is ready. 7:30 p.m. Dishes are all washed and put away. I’m so glad the girls cleaned up as I’m going to be canning more chicken broth tomorrow. Looks like I’ll get around 70 quarts. Joe and the boys are still outside working. They are moving a fence over that needs to be moved for the new building. Joe and his sons enjoy longer evenings to get some work started on a new pole building for the farm.